" Cleaning dog ears is an important part of maintaining the health of companion dogs. Cleaning canine ears at home is recommended for the outer or accessible parts of the ear only. Most dogs are required to have their ears cleaned once in a week. Detailed cleaning and inspection should be done by a veterinarian or a professional groomer at least once every six months. The procedure for cleaning dog ears at home is not complicated. All that is needed is a quality dog ear wash solution, some cotton swabs and care when cleaning. " Dog owners should have a basic knowledge of the ear’s anatomy. Cleaning the outer parts of an ear is a simple procedure. One should remember that the anatomy of a dog’s ear is relatively complicated. There are three main anatomical divisions of a dog’s ear, i.e. outer, middle and inner parts of the ear. Owners must limit their cleaning efforts to the outer part of the ear or up to the portion in plain sight when cleaning, as carelessness can lead to sever injuries and irrecoverable damage to the ear drums. 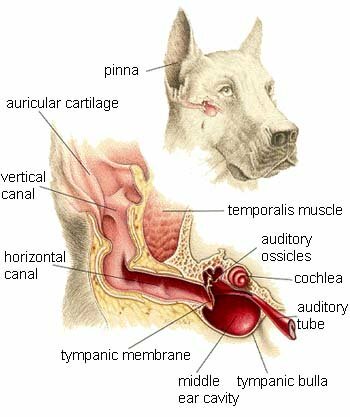 Moreover, the dog ear canal is relatively more complicated than a human ear canal. In dogs, they are “L” shaped which means that they form a right angle followed by series of curves, thus extreme care is needed to prevent any injury etc. 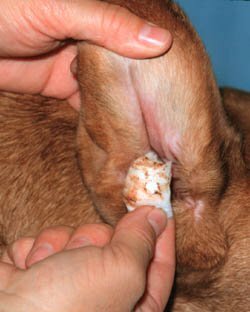 A dog owner should try to clean a dog’s ear only if he/she has some basic knowledge of dog ear anatomy and the pet is friendly enough to him/her. Moreover, the other part of preparation may be in formulating and/or selecting a suitable dog ear wash solution. An owner can purchase a high quality commercially available dog ear wash solution such as Nutri-Vet Ear Cleanse or the homeopathic dog ear cleaning solution Ear Dr. An owner can also prepare a canine ear wash at home. Vinegar, rubbing alcohol, hydrogen per oxide etc are some components which can be used as dog ear cleaning solution, but one should remember that the pure form of these solutions can severely damage the inner parts of the ear. Dilution with normal saline or distilled water should be done prior to use. Diluting vinegar with equal parts or 2/3 of normal saline, depending upon the condition of the dog’s ear or a 2 – 3 % diluted solution of hydrogen per oxide can be a safe option as a dog ear wash solution. A Dog should be properly restrained before proceeding. Some dogs do not like their ears to be inspected or cleaned. Suitable actions such as restraining the mouth, head and forelimbs along with offering treats can help, but if a dog does not allow ear cleaning even after restraining, cleaning should be left to a professional groomer or veterinarian. As shown below, one way to keep a dog still during treatment is to place the dog on a table. You can hold the dog steady by placing your arm across the dog's body. Wrap the other arm under the head and use your fingers to push the ear flap away from the ear, which will then be available for cleaning. Once a dog is properly restrained, cotton swabs or cotton balls should be thoroughly soaked in ear cleaning solution. The outer part of the ear should be cleaned carefully followed by cleaning the inner parts of the ear canal. A good rule of thumb is that if you cannot see the tip of a Q-Tip in the ear, then it is in too far. The procedure should be repeated 3x to ensure that the outer parts of the ear canal are cleaned. Let the dog shake off extra moisture after completing every cleaning step. The deeper part of ear, which is not visible, should not be cleaned by the owner. Let a well trained groomer deal with that part. This simple procedure for cleaning dog ears, specifically the outer part of ears, can be done at least once a week. Let a professional handle detailed grooming and cleaning which includes inspection, cleaning of the deeper parts of the ear and clipping of extra hairs (if needed. Owners must not try if on their own unless they are properly trained. Dog ears are a favorable place for microorganisms to grow. Dog ear fungus, parasites and bacteria might grow in the ears, which can lead to severe ear problems. When cleaning dog ears, an owner must closely watch for any abnormality in the ears such as extra wax production when compared to the last cleaning, signs of inflammation or redness, injuries and any discharge from the inner ear. Such conditions should be immediately reported to a veterinarian. A veterinarian can do a detailed canine ear exam and after diagnosis, the veterinarian might recommend the use of specific drugs and topical preparations. Do not try to clean the ears of a dog that is not friendly or resists when you approach the ears. 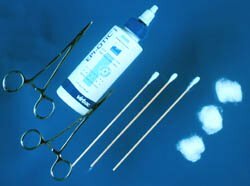 Q-Tips can be used, but should be avoided in favor of cotton balls. An owner must make sure that an ear wash solution is diluted and prepared with the recommended proportions of ingredients. 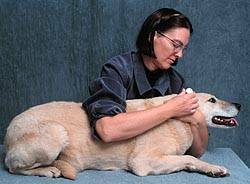 Any abnormality and/or dog ear infection should only be treated by a veterinarian.